Carrots are a naturally sweet and nutritious vegetable that contains a plethora of fiber, potassium, vitamin C and vitamin A, the latter of which can help you to maintain eyesight and skin health. 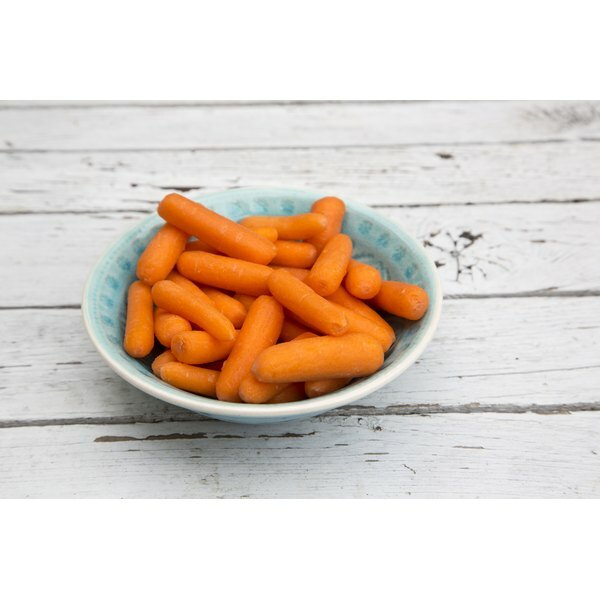 Baby carrots, in particular, make for convenient snacking either on the go or at home. For a different variation, roast them in the oven with olive oil. Place 20 to 25 baby carrots on a baking sheet or in a shallow roasting pan. Drizzle 3 tbsp. of olive oil onto the baby carrots. Rub the oil into the carrots so that each carrot is fully covered in oil. Sprinkle 1 tsp. of salt and ½ tsp. of black pepper onto the baby carrots. Place the carrots into the oven and cook for 20 minutes. Remove the carrots from the oven when they are finished cooking; the baby carrots should be slightly browned and tender. Serve immediately. Overcooking will result in mushy carrots; keep an eye on the carrots as they are cooking, removing them from the oven as soon as they are tender.